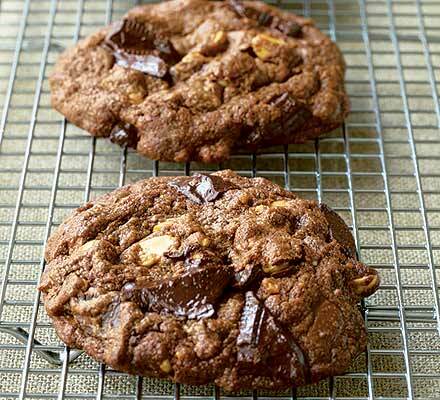 Chocolate Chunk Cookies – PUT THAT IN MY FACE. *I use all sorts of things in recipe, big chunks of chocolate, white chocolate, nuts, heck, go nuts. If you’re baking the cookies on the same day you prepare the batter, heat the oven to 350 degrees and position a rack in the center of the oven. Using a stand mixer fitted with a paddle attachment (or mixing by hand with a wooden spoon), beat the butter, granulated sugar, and brown sugar on medium speed until mixture is light and fluffy, about five minutes. Stop the mixer and use a rubber spatula to scrape down the sides and bottom of the bowl and the paddle itself a few times; the sugar and butter love to collect here and stay unmixed. Beat in the eggs and vanilla extract on medium speed until thoroughly combined, two to three minutes. Again scrape the bowl and the paddle to make sure the eggs are thoroughly incorporated. Mix together the all-purpose flour, bread flour, baking soda and salt. Add both chocolates to the flour mix and toss to combine. Turn the mixer to low speed (or continue to use a wooden spoon if mixing by hand) and slowly blend the flour-chocolate mixture into the butter-sugar mixture. Mix until the flour and chocolate are totally incorporated and the dough is completely mixed. For best results, scrape dough into a container and let rest in the refrigerator for a day before baking. The next day, heat the oven to 350 degrees and position a rack in the center of the oven. Drop the dough in ¼-cup balls onto a baking sheet about two inches apart. Press dough balls down slightly with the palm of your hand. If the batter does not fit all on one tray drop cookies on a second baking sheet and bake when the first tray is finished. If you have only one sheet tray, bake one batch and then cool the tray by running it under cold water before baking a second batch. Bake until cookies are golden brown on the edges and slightly soft in the center, 15 to 18 minutes. Remove from oven and let cool.